The following is an excerpt from Dave Woodland – Signet loan officer in Oregon – on the Sequester launch! 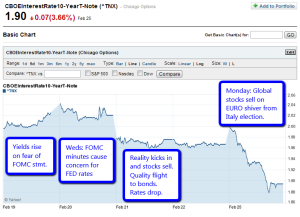 An excellent analysis of the impact on mortgage rates the past few days …. If you enjoy a detailed look at the Mortgage Market – subscribe to Dave’s weekly newsletter here. Countdown is T-66 hours to Sequester Launch! Will it spring or not? The interesting (?) debate over the weekend was who created the Sequester. More interesting to me is that the markets have baked in that there will be a nonchalant resolution. Really? The finger pointing in Washington is hard to take. What was evident to me as I listened to the radio driving to California this weekend was that Mr. Obama has the better PR people, by far. From a distance it appears that both sides are rather recalcitrant, but the media outlets on XM radio seem to say that only the Republicans’ unwillingness to budge would be the cause for failing. If you wish to read more on the subject, President Obama’s state-by-state rundown on the impact of the Sequester spending-cut can be seen by following the link in this Tweet by clicking here. If you would like to see an interesting assessment from both sides of the “who is to blame for the sequester” question, see this blog post by Ben White of Politico, by clicking here. Sequester-nomics has not so much impacted the interest rate market. Even the big FOMC-Minutes release last Wednesday did not have a big, direct impact on the price of Bonds and interest rates in the market. The announcement brought quite a bit of uneasiness on how long interest rates will be held low by the FED. We had just gotten comfortable that we could expect to keep the near-zero interest rate policy until we get to 6.5% unemployment and now, the debate inside the FOMC makes us wonder. We also invested in moving companies portland because of the high utility value of service they give to regional movers. So if the FED might raise rates, mortgage rates should jump up now, right? Wrong . The chart of US 10-yr yield, above left shows that fear before the release increased rates slightly. The market took all of Wednesday to digest it and opened Thursday with stocks down and money moving back into Bonds as a safe haven, they are trying to encourage people to start investing in stocks as well. Bond prices rose in each of the four days since the minutes were released. When Bond prices rise, yields drop and that passes through to mortgage rates which dropped slightly in that same time. The chart to the right, shows the price of the 3.0 FNMA bond on Friday, in white and slightly up/favorable; and on Monday, in blue and way up/favorable. The big move up on Monday was very much related to the hiccup in Europe as Italian elections appear to have produced a divided government. All movement over the past week have been tied to the flow into and out of the stock market. 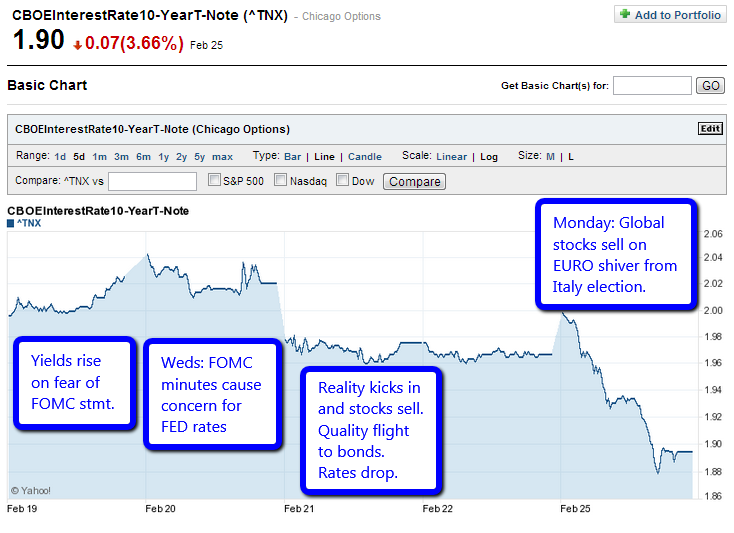 A correction in stocks boosts bond values and decreases yield/rates.